Ok so I have stolen my header from the title of a book written by Ann B. Ross but it seemed appropriate given that this week I finally had my first opportunity to photograph the incumbent Prime Minister of Australia... Julia Gillard. Much has been written, discussed and debated about the present PM which is natural given she is a political figure... but much of what has been written, discussed and debated has not been about her stewardship of the country. Now I have had the pleasure (or not... depending on your politics) of photographing three other former Prime Ministers at close quarters and many, many MP's... both federal and state... and I have often noticed that the impressions I receive from training a lens on them are often quite different to how the general public perceives the people who are charged with leading the country. 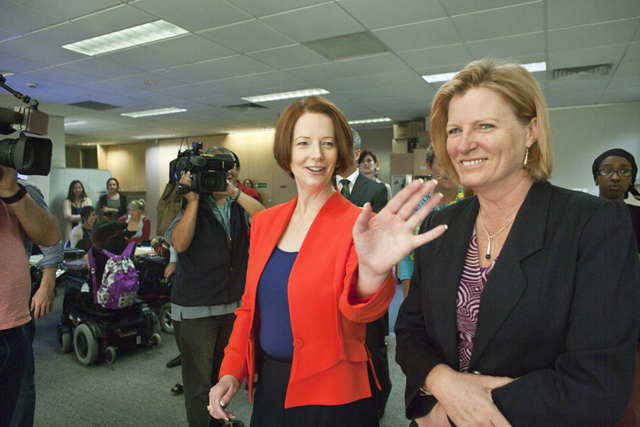 I mean...so who is Julia Gillard really? Julia Gillard is no Margaret Thatcher (thank goodness) yet one of the leading lights of 70's feminism, Germaine Greer, has, rather than focusing on the incredibly positive aspects of being a woman PM, simply and naively played into the hands of the peanut gallery by making a comment about the Prime Ministers body shape and choice of clothes. In all sorts of ways that is wrong. I wonder if Julia Gillard woke up one day and said to herself "One day I will be the first woman Prime Minister of my country"? I think if she had and knew in advance that instead of people celebrating the way she has governed the country as a very different style of Labour Party leader...( lets face it Australians aren't as a whole used to a quiet achiever, all the Prime Ministers I can think of have been very distinct personalities... I mean Bob Hawke and Gough Whitlam are flamboyant, Paul Keating is a sharp wit, John Howard is a patriarch and Kevin Rudd is earnest)....and concentrated instead on the size of her derriere, what jacket she was wearing the fact she forgot to have children, didn't get married and by the way is a non-believer as well.... then she just might have given up in the battle to break through all of the prejudices to get the top job. Which she is not doing too badly at all. Australia is one of the few countries that is not in complete economic decline and while you can argue the two speed economy is hurting many sectors of the community Prime Minister Gillard is not responsible for Reserve Bank decisions. So where is the credit for her on a personal level? Several of my friends have talked about this, with one female friend saying that obviously while we all like the idea of a woman leading the country the reality is no-one really is comfortable with a childless, unmarried, atheist doing it. So I have a certain amount of empathy for Julia... When I photographed her to begin with, her media training kicked in but she seemed quite vulnerable and self conscious. Well who wouldn't be after suffering Germaine Greer's childish schoolyard taunts...But when the private part of the function began she was much more at her ease and had a dry and quite incisive sense of humour...plus she "got" some of the wise cracks I made so I have to say she is far warmer and jollier than she may appear through the general media perception. "If she wasn't a woman she would be the best Prime Minister we have ever had"
Put that where you drawing attention to Germaine! This is a portrait I took of a friend of mine Maurial Spearim. I call it 'My Spirit Goes Before Me'. 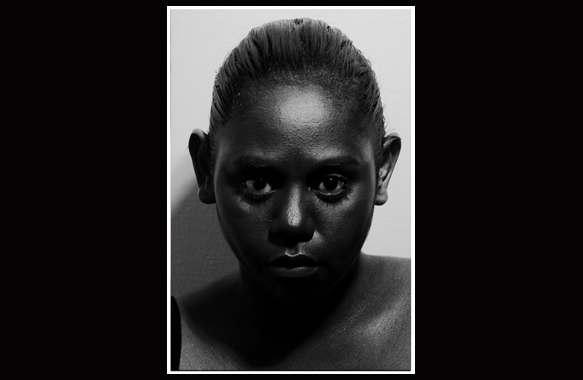 She is a proud Murri woman from the Gamilaroy mob of north western NSW. She is an intelligent, beautiful and very fine actor who is performing in a solo show at this very minute at the Museum of Victoria here. I am sure that she, like many other of my friends and myself also found it incredibly insulting, disturbing and amazingly stupid that the Foxtel commentators at the Australian Open, including recognised past tennis great Wally Masur, discussed one of the Spanish tennis players Almagro, not in terms of his tennis game but in terms of his skin colour. After remarking on how 'olive' skinned he was, Masur and his co-host leapt to the immediate conclusion that Almagro must therefore be related to the Moorish people of Northern Africa. That Almagro would therefore be able to cope with the heat at the Australian Open better than the other players. The subtext to this of course, based in the history of the slave trade, is that 'black' men work better in the heat because they came from hot countries and therefore you could justify leaving a slave to work through the heat of the day with little shade or water because they naturally could 'cope'. What a completely racist insinuation... How is it that the braniacs that came up with such a discussion have jobs as media commentators?